Many San Diegans love Hillcrest, but the HBA is truly a champion for Hillcrest. For almost 100 years the HBA has worked to advocate for the business district and promote activities that support neighborhood businesses. The HBA was a champion in the creation of the Uptown Planners, the Joyce Beers Community Center, the Uptown Community Parking District, and the BID Alliance. For many years the HBA has worked to create a pedestrian promenade on Normal Street. By building a coalition of supporters and assembling funding, the HBA has set in motion a plan to create a space that will benefit the neighborhood for generations. The promenade includes a public space, expanded Pride Plaza, the addition of over 60 parking spaces, a protected bike lane, security, and a full events schedule. San Diego Association of Governments, Uptown Community Parking District, City of San Diego. Hillcrest Business Association, Hillcrest Town Council, Rise Uptown, Circulate San Diego, Bike SD, and Hillcrest Farmers Market. The Normal Street Promenade is a formal project of SANDAG. Find out more here. Success! The Pride Flag was constructed in 2012 and the Hillcrest LGBT Monument was constructed in 2013! The HBA worked for several years to design and display a 65-foot flagpole and Pride monument to permanently display a rainbow flag at the intersection of Normal St. and University Ave. 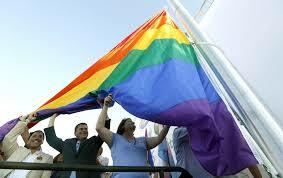 The rainbow flag is 20 feet by 30 feet. This monument has become a gathering space for the community in times of celebration and sadness. 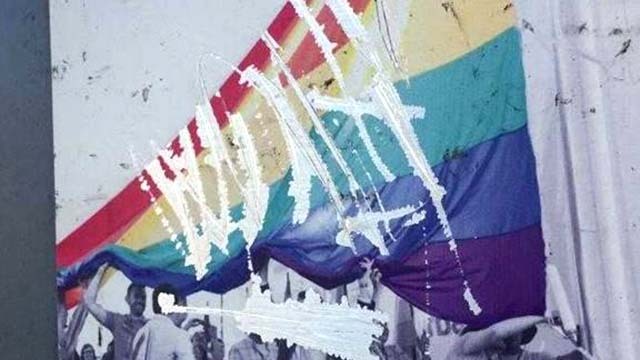 In 2019, the Hillcrest LGBT Historical Monument on Normal Street was vandalized in a hateful crime. Hillcrest businesses stepped forward and quickly raised the $10,000 needed to repair the monument. Groups that held fundraisers included the Crest Cafe, Hale Media, Vom Fass, Rise Uptown, and the Cohn Restaurant Group. Success! The HBA’s recommendations were all adopted into the plan which was approved by the City Council in 2017! In 2010 the Hillcrest Business Association (HBA) created “Hillcrest 2.0”, a series of business forums in the neighborhood of Hillcrest. These forums were attended by business owners and residents in the community and each had a designated topic relevant to the upcoming Uptown Community Plan. Significant outreach was undertaken to ensure participation and representation from a variety of backgrounds. Information and feedback from the 2.0 series was compiled in 2011, and with our Board of Director’s input, summarized into a plan for Hillcrest’s future. Many folks will agree that the State of California DMV facility on Normal Street is in sore need of repair. Over the last decade there have been a variety of proposals that describe how the state will renovate its old facility. One popular, but now defunct plan, was to create a large mixed use building on the site with parking below and a new DMV facility on the ground floor. In recent months, the State has proposed a renovation of the facility and has abandoned the idea of mixed use facility. Their plans can be found at www.normalstreetdmv.com. The plans have proved to be pretty unpopular with the neighborhood and a variety of community leaders and organizations have weighed in. Council member Chris Ward weighed in. The HBA objected to the proposed six foot fence around the site that would negatively impact the Hillcrest Farmers Market and the Normal Street Promenade. Assembly Member, Todd Gloria requested the DMV re-examine their plans. SANDAG (the San Diego Association of Governments) is San Diego County’s regional transportation planning authority. They are empowered by the state of California to plan regional transportation efforts. Their bike lane efforts focus on constructing “protected bike lanes” throughout Hillcrest. Their plans and information are here. Protected bike lanes take up a lot of space and often require the removal of parking spaces due to the requirement that adequate sight lines be maintained relative to the bike lanes. When SANDAG first proposed their bike lanes, their proposal included almost 191 lost parking spaces throughout Hillcrest. University Ave. between First and Tenth: In 2015, the HBA, local property owners, and our partners at the California Restaurant Association hired a lobbying firm to negotiate a compromise to make sure that certain parts of the bike lane be curtailed along University Ave. in order to reduce parking losses. With help from then City Council Member Todd Gloria, the section of SANDAG’s project between First Ave. and Tenth Ave. on University was removed from the project. Fourth and Fifth Ave. between Bankers Hill and Hillcrest: The San Diego Association of Governments (SANDAG) is proposing a bike lane from Downtown to Hillcrest and while the HBA generally supports bike lanes, there are a number of challenges. The HBA has successfully reduced the number of losses on this section of the bike way to 12. The City of San Diego has a bike master plan that seeks to create a bike network connecting neighborhoods. Their bikeway consists of painted bike lanes throughout the city. They are currently deploying their bike network as streets are repaved and repainted. In Hillcrest their bike lanes are being added as various pipeline replacement projects are completed. University Ave. between First and Tenth: At the request of then City Council Member Todd Gloria, the section of SANDAG’s bikeway project between First Ave. and Tenth Ave. on University was removed from their project. In 2016, the HBA and the City of San Diego negotiated an agreement that resulted in a net gain of twenty spaces, mainly on Essex St. and Tenth Ave., related to the City installing their painted bike lanes along University Ave. and completing the “gap” created by Council Member Gloria. The east end of Hillcrest has been growing for years and the level of maintenance expected by businesses has not kept up with reality. The primary way that neighborhoods provide services beyond what the city provides is to form Maintenance Assessment Districts (MADs). MADs are an assessment on property owners that is, through contract, provided to a third party that provides the services the owners want. On the east end of Hillcrest, there is an existing MAD that maintains the planted medians between Tenth and Normal Streets. Formed an organizing group and began meeting regularly. Conducting a preliminary survey. The survey has had a 30.06% response rate (324 responsive parcels). This is a particularly high response rate considering that a typical response rate for a direct mail campaign is often less than 2%. Of property owners who were petitioned 27.09% (292 parcels) answered yes to the question as to whether they would like to move forward with the process of expanding the MAD. The HBA also presented the findings of the survey and the proposed expansion to the Uptown Community Planners Committee in March of 2016. The HBA has worked over the years to, where appropriate, assist the City and County with their efforts to solve San Diego’s homeless issue. Attracted by hospitals, canyons, and Hillcrest’s generous nature, many homeless people live in Hillcrest. In 2016, the HBA funded a homeless engagement team as part of a partnership with the City of San Diego and the Alpha Project for the Homeless. Currently, the HBA is working with the County and the City to find a location for facility that can assist the homeless after they have received medical care from the area hospitals.